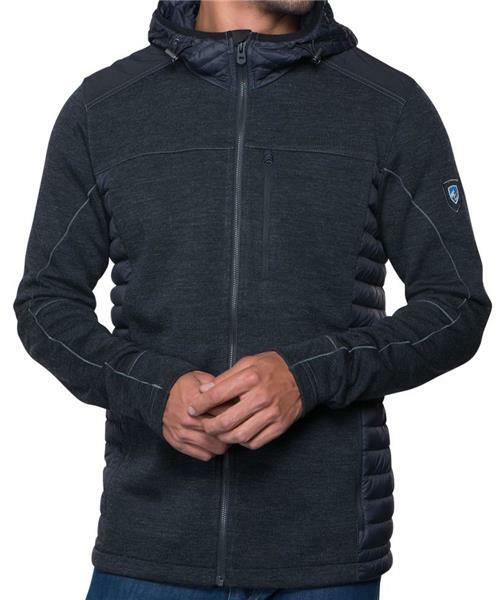 The Kuhl Alskar™ Insulated hoody features Ultraero™ fabric, a wool blend mélange fleece. The back panel and hood is constructed from a soft, lightweight 20-denier fabric with 800-file down insulation, and an extra layer of insulation provides superior warmth. The inside collar is lined in micro suede for added comfort and insulation, while cord lock adjustments at the hood opening provide a custom fit. KÜHL’s exclusive articulated 5-panel sleeves provide better range of motion. The Alskar Insulated hoody features two reverse coil zippered hand pockets. Tested to more than 10K pulls, the Metaluxe™ center front zipper looks like metal at one-third the weight and features the Kuhl crest. Custom reflective ribbon at draft flap prevents snags and increases visibility in the dark. Machine washable for easy care.